Northern Flickers are unlike most other Tennessee woodpeckers in that they are primarily brown instead of black and white, and often feed on the ground. In fact Northern Flickers eat more ants than any other bird in North America. They are easy to identify, especially on the wing, with their strong undulating flight and prominent white rump. Northern Flickers are found across North America from the northern extent of forest in Alaska and Canada, to Cuba and Central America. The northernmost birds migrate south in winter. This woodpecker was formerly called the Yellow-shafted Flicker in the East and the Red-shafted Flicker in the West because of their distinctly colored wing-linings. They are now recognized as belonging to the same species. Description: This medium to large woodpecker is overall brownish with barring on its back, clear round spots on its breast, and a black crescent on its chest. In flight the white rump is conspicuous, as are the yellow wing-linings (red in western birds). Eastern birds also have a red crescent on the nape of the neck. Males and females are similar but only males have a black mustache stripe on the face (red in western birds). Voice: The territorial call is a long series of wick wick wick notes, rising and falling in volume and lasting 7 or 8 seconds. This call is similar to the call of the Pileated Woodpecker. 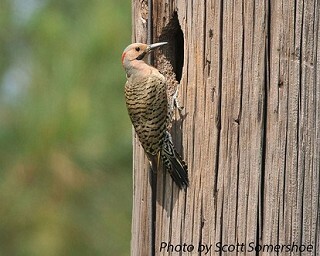 Northern Flickers also make a loud kyeer note. The Pileated Woodpecker call resembles that of the Northern Flicker wick wick wick call, but is louder and changes in pitch, and rhythm. No other Tennessee woodpecker has the combination of overall brown coloration with bright white rump. Habitat: Northern Flickers are found in open woodlands, forest edges, including cities and suburbs, and will visit backyard bird feeders. They nest in almost all forest types found in Tennessee. Diet: Mostly ants but also beetle larvae, and during late autumn, winter and early spring, a variety of berries. Nesting and reproduction: Males and females vigorously defend the space around their nest tree but do not defend a feeding territory, probably because their food sources are not economically defendable. Clutch Size: 4 to 8 eggs. Incubation: The male incubates the eggs more than the female, and the eggs hatch in 11 to 14 days. Fledging: Both adults feed the young regurgitated food. They leave the nest after 24 to 28 days and remain with the parents for a few additional weeks. Nest: Northern Flickers frequently reuse a nest cavity from a previous year. Males do most of the excavation of new cavities in a dead tree or the dead limb of a live tree. They will occasionally dig cavities in wooden utility poles and fence posts. Excavation time is about 12 days. Nest heights in Tennessee have been recorded from 4 to 45 feet with an average of 18 feet. Competition for cavities with European Starlings is common. Status in Tennessee: Northern Flickers are a fairly common permanent resident, and are more numerous in the winter due to the arrival of migrants from northern breeding areas. Numbers in Tennessee are declining, possibly due to competition with the European Starling for nest cavities. More than any other woodpecker, Northern Flickers forage on the ground. Very few birds eat ants, but they are a favorite food of flickers and they will dig in the dirt to find them. 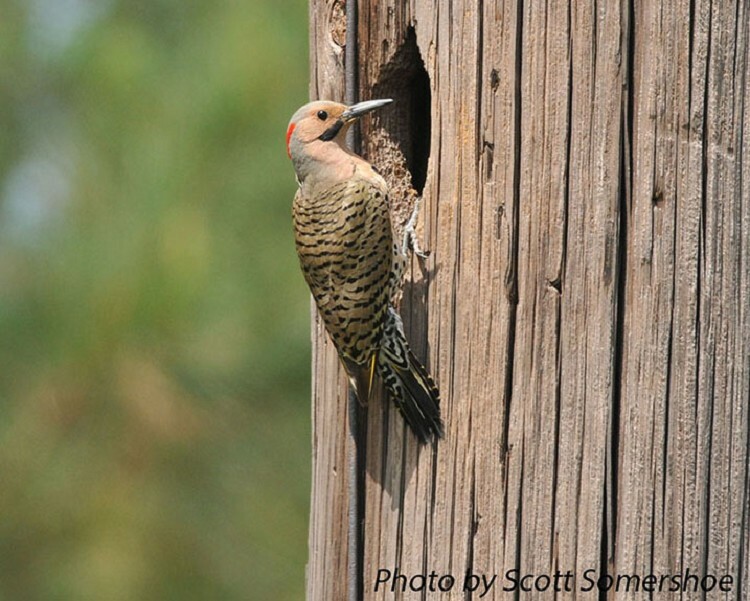 Northern Flickers have been known to cause property damage by drilling holes in wood and synthetic stucco siding, and eaves of houses. The oldest known Northern Flicker in the wild was 9 years 2 months old. Best places to see in Tennessee: Every county in the state. Moore, W. S. 1995. Northern Flicker (Colaptes auratus). The Birds of North America, No. 166 (A. Poole and F. Gill, eds.). The Academy of Natural Sciences, Philadelphia, PA, and The American Ornithologists' Union, Washington, D.C.